BaReH9 is the most hydrogen-rich inorganic salt discovered thus far, and is of great interest in the study of superconductivity in dense hydrides and also the metallization of hydrogen at high pressure. The unusual composition of this material suggests that investigation of its high pressure properties should offer a number of important insights into both of these critical issues. 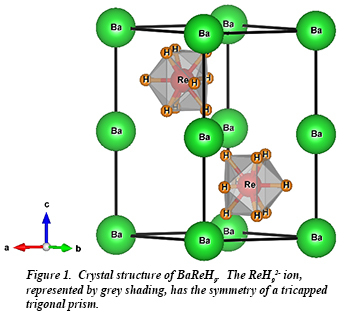 Under pressure, BaReH9 becomes metallic and then superconducting at above 100 GPa with a Tc of approximately 7 K. An important matter is how the crystal structure and associated properties evolve with pressure. In recent work, a group at Carnegie, including CDAC predoctoral student Eugene Vinitsky, carried out crystallographic and spectroscopic studies on a sample of BaReH9 up to 80 GPa to gain further insight into the high pressure behavior of this unique material.